Jake Fortin, a member of the '07 and '08 Troopers, submitted this photo and caption. This is a photo taken at a recent get-together of drum corps members (and a couple of age-outs) in Boise, Idaho. We decided that we needed a picture of all of us in our corps jackets, and thus had the photo taken. 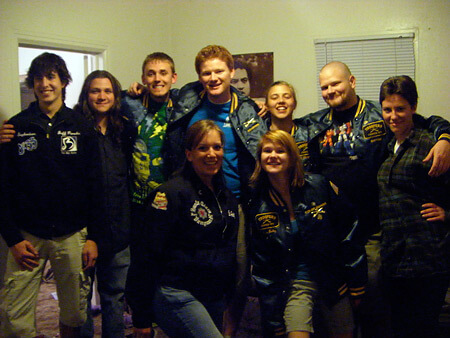 From left to right: Jeff Paradis, Kyle Gibbons, Aaron Salazar, Erin Holtz, Jake Fortin, Lara Bailey, Carly Strough, Jason Weimer, Hannah Sutcliffe.